Ask fellow campers about "Falcon State Park" and nearby attractions. Older asphalt water & electric sites almost level. Newer, full-hookup sites very unlevel. The Recreation Hall is the most active I've experienced at any government park: Pot lucks, jam sessions, talks on a variety of subjects, bird walks, nature walks, butterfly garden tours. Open all day for playing games, visiting, drinking coffee. Very friendly hosts. WiFi available. We camped at Falcon State Park in a Motorhome. Nearby birding sites include Falcon County Park, Salineno, and Chapeno. This park is quite remote; no large towns nearby. Good interior paved (chip seal) roads and sites - many sites need leveling. Hookup sites are "c" shaped, along sides of the road; and are very close together. Luckily, Winter Texans proved to be friendly, good neighbors. Hookups are on the wrong side, so bring extra hoses for water & sewer. Lakeview sites are water only - no electric. Nearby lake access with boat launch. Nice roads & trails to hike, bike, and walk dogs. Keep them leashed, though, because Javelinas roam through the campground. This is a great campground if you're a fisherman or a birder, or enjoy wildlife and quiet. We would stay here again. We camped at Falcon State Park in a Fifth Wheel. Be sure to visit nearby Salineno to watch the colorful, tropical birds. Very pretty even if you're not really a "birder." El Mexicano Restaurant in Roma was recommended by a local, and was very good, clean, and reasonable. Lovely park. Cell service great. No OTA tv except for Mexican stations. Lots of Javelinas and birds. So be careful. Great hiking trails. The sites are level. Park well maintained. We camped at Falcon State Park in a Motorhome. The full hook up sites are C-loops pull thrus all in a row. Most need leveling and the hook ups are on wrong side. Found nothing attractive about this set up. The electric sites only seemed a little better laid out. Same arrangement but more foliage. Park WiFi okay. Verizon 4G LTE had 2 bars. Satellite TV had a clear shot. We're here to bird and on way to Big Bend. Don't miss Salineno. Ask office for directions. Fun birding experience. We camped at Falcon State Park in a Travel Trailer. Quiet, coyotes yowling, birds all over. Remote spot, some sites over looking Falcon Lake/dam. Hard to level our 27 ft MH. Water/electric good. Lots of friendly winter Texans. One night stay, would stay again. Using the free park WiFi, which comes and goes. We camped at Falcon State Park in a Motorhome. Great for bike riding. Good star gazing. Grouved billed Ani! This is a state park with paved pullouts for sites. Most sites need to be leveled; mine needed two inches. Nights are quiet and stars shine brightly. Many winter Texans stay here and create a friendly, welcoming community. Hiking trails are easy and there is great bird watching in the park and nearby at Salineno. Restrooms could have been cleaner and water pressure was so low that when anyone flushed the toilet, the shower ceased to flow. One shower did not work at all. We camped at Falcon State Park in a Travel Trailer. We arrived New Years 2016 and told by office ranger that all sewer hookups in park were closed due to system upgrades. If you desire water /elect. Only, this park is ok. The Falcon dam border crossing is a nearby drive. Dam built in early 1950's , as a joint effort between USA and Mexico. 10lb. Bass in lake I heard. We camped at Falcon State Park in a Travel Trailer. Just be aware that all pull thru sites have 4 wooden posts to protect pedestal. Narrow between posts and picnic table roof. Most asphalt sites tended to lean towards road, so bring your levelers. Many birds in park, just watch pets for roaming javalinas. Falcon State Park near Falcon Heights, TX. We stayed in full hook-up loop site 215 for $18/night. Pull through sites. Utilities are on opposite side than most pull throughs so door opens to street. Nice hiking trails and views of lake. Lake is not accessible from camping area. Very secluded park. Miles from fuel and grocery. We camped at Falcon State Park in a Fifth Wheel. Great park if you are a birder. Also, boat ramps for the fisherman. Staff was very helpful and interested in making this a great experience. We would love to come back in the future. We camped at Falcon State Park in a Motorhome. $16 per night was for a full hookup site at their weekly rate plus a couple of days. 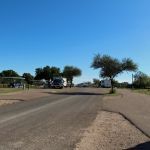 In addition, a daily entrance fee of $3 per person is charged unless you have a $70 Texas State Parks Pass, which is good to cover entry fee to all state parks for one year. Dirt/sand sites are mostly level with asphalt pads for parking. Each site has a covered concrete pad with a picnic table in addition to the fire ring and BBQ grill. The park does have vegetation surrounding each site that includes wild oregano, wild olive, hibiscus, mesquite thickets, huisache, and prickly pear cactus. Animals we saw during our stay included roadrunners, bobcats, deer, jackrabbits, armadillos, and javelina. There are also many types of birds and the park is near the Roma Bluffs World Birding Center in Roma, TX. There is a butterfly garden near the recreation hall. The nearest shopping is in Roma, about 15 miles east of the park. If you like hiking/biking there are trails within the park and roadways outside the park. Fishing/boating is available on Falcon Reservoir. The park hosts/volunteers have many scheduled activities including crafts, potluck dinners, jam sessions, and the like. Spacing between the sites is very generous. We received three bars 4G on our AT&T cell phone. We used our Millenicom Jetpack as a Wi-Fi hotspot and it worked very well on three bars of Verizon 3G. There is Wi-Fi at the office, which is one mile from the campground. There is Wi-Fi in the campground but it was very slow. We received one English over-the-air TV station and several more in Spanish. Radio reception was mostly Spanish. We camped at Falcon State Park in a Motorhome. We stayed here for 2 weeks. We enjoyed the bike paths and also rode the paved roads. The volunteers stay several months in the winter and have been doing so for several years. They are a close group but are very welcoming to visitors. We were invited to game night and potlucks. The club house is large with lots of books, puzzles and DVDs as well as 2 washers and 2 dryers. The cost is $1.50 per load. The butterfly pavilion is a nice spot to walk around or sit. The staff was expanding WIFI to the campsites. However, it was painfully slow at 18 KB per second. Here are a few things we didn't like. The sites are very close to each other and are not level. They will be working on the leveling problem in June. The spaces are pull thru but are short and hard to navigate as they have tight curves. The closest town is Roma about 12 miles away. There you will find a big grocery store and restaurants. There is a little store about 2 miles from the park for bread and milk and such. We camped at Falcon State Park in a Fifth Wheel. This is a great state park. The bird watching is fabulous here. It is a nice quiet park, it is about 50 miles to a town of any size with groceries. The sites are paved, some of the sites in the full hook up section are not level but as long as you are prepared for that you would be fine. Restrooms are clean with hot showers. Lots of trails to hike and pet friendly. We would definitely stay here again. In fact we have extended our stay and may do so again. We camped at Falcon State Park in a Travel Trailer. What a gem of a find at $16.00 a night. Beautiful pull-throughs, birds flying and singing everywhere, hardly a camper in sight. The trails are really well maintained, the rec hall lovely. They even have bird blinds with feeders to get a chance to see some of the many species available. Cactus were blooming, too. Bathrooms are good, showers usually had a few spideys in them, but they ran away. Would have given it a 10 except no swimming. We camped at Falcon State Park in a Motorhome. This was an alright state park but we'd pass on by if in the area again. Our site was not at all level and pull thru. The sites are quite short and very close together. Also in the section we were in (the 200 loop) every sites hook ups are on the wrong side, hard to imagine who planned this set up but they certainly weren't rv'ers. The sites were loaded with burrs (aka "goat heads") so enjoying the site was impossible as was walking a dog on anything other than hot blacktop. The staff was very friendly and check in was quick and easy with a reservation. We camped at Falcon State Park in a Motorhome. One of our favorite destinations in Texas. Nice private campsites with the most colorful and beautiful birds we've ever seen. Also there is a boat ramp and fishing from the shore is allowed without a TX license. One of the best bass fishing lakes in the U.S.The staff are amazing. We were there at Christmas and they invited us to a potluck dinner that was great. We camped at Falcon State Park in a Fifth Wheel. Are you affiliated with Falcon State Park ?